Alleghany County was created from land carved out of what was primarily Ashe County in 1859. James H. Parks was an early businessman whose store stood near the present location of the ABC store. He was one of three men who donated land for the county seat in 1866 and is credited with suggesting naming the town Sparta after the Greek city-state. The present court house was constructed in 1910 and is listed in the National Register of historic buildings. Noteworthy businesses include: The Alleghany News, which traces its history to The Alleghany Star, established in 1889 by A.S. Carson. The Bank of Sparta was established in 1902 and merged with three other banks to form Northwestern Bank in 1937 under the leadership of Sparta businessman Edwin Duncan. It grew to be a major financial institution in northwestern North Carolina until it was bought by First Union in the late 1980s. 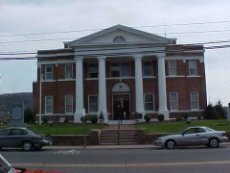 Like many southern communities, the court house occupies the town's center. Today's court house is modeled after the original 1909 structure that burned in the 1933 fire. Little more than the columns and foundation remained. During the early part of the twentieth century, the Alleghany countryside was dotted with small farms and Saturday would see farm families pour into Sparta to visit and trade. One of the prominent stores of that time was N. B. Smithey's store, the large rock building next to the town office built in 1936. Smithey had built a number of such stores in communities in the northwest mountains, fore-runners of the modern department store. Smithey's sold clothing, household goods, groceries, and even sported a cafe. The Smithey's chain closed in the 1990s with the death of Mr. Smithey's son-in-law who had inherited the business. Another prominent store of the time was Farmer's Hardware, located across from the court house. Opened in 1936, R. Amos Wagoner, Sr. bought into the business in 1937 and it remains in the Wagoner family today. It has the longest history in Sparta of operating out of the same location and under the same ownership. In the latter half of the twentieth century, small farms were consolidated into larger operations and much of the employment moved to manufacturing. The county's oldest manufacturer, Sparta Industries, began as D&P Pipe works in 1943, and produces Dr. Grabow pipes. The county's largest employer, Bristol Compressors, opened in Sparta in 1994. Other large manufacturers in Sparta include NAPCO and Magnolia Manufacturing. The town's first shopping center, Trojan Village, was opened in 1977 by developer D.W. Miles. Another shopping center, Sparta Plaza was opened in 1986 by Ken Richardson. Fire has played a critical role in the town's development. In January of 1933, a fire that began in Ray's Lunch Room (presently Sparta Restaurant), burned half the buildings on the block, jumped the street and destroyed businesses and much of the court house before it was brought under control. The fire left little more than a shell where the court house stood. It was rebuilt, but being that this was the depression, the newer structure lacked some of the grandeur of its predecessor. The town had little in the way of a fire department and dynamite was one of the tools used to bring the fire under control. This event prompted the establishment of the Sparta Fire Department. Shortly after midnight on January 28, 1986, a traveler stopped in a convenience store to report smoke was pouring from Sparta Restaurant. Fire departments from Alleghany and surrounding communities battled until early morning in temperatures as low as minus nine degrees Fahrenheit to bring the town's second worst fire under control. Four downtown businesses were destroyed, but the fire was contained to that city block. Determined not to be done in, the fire prompted a renewal of that portion of town. The area was rebuilt and Sparta Restaurant continues to operate from the same location. Sparta was granted a U.S. Post Office on June 24, 1879 - long after the town was created because there was already another town named Sparta, in Edgecombe County, that had a Post Office. The earlier town decided to change its name to Old Sparta in order for the county seat of Alleghany County to get its post office. Its first Postmaster was William L. Nooman, and it has been in continuous operation ever since inception.